We are the only house on our street that is complete. 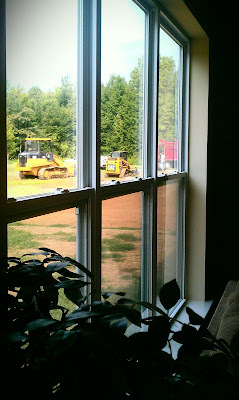 Loud machinery, hammering, banging, plowing, etc begins at around 7:30am everyday and doesn't end until 7:00pm nightly. But it's all worth it because man do we love our house! Think of all the fun you and your new neighbors will have once they move in! Can't wait to hear about the adventures! I hope lots of young people move in around you! We have construction going on next door to us right now. 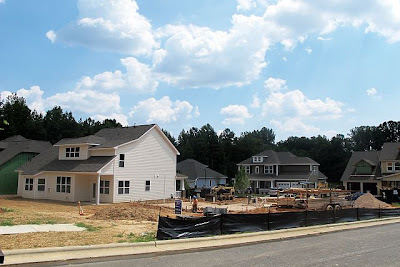 It used to be a nice peaceful wooded area but that changed a couple of months ago and now there is a house going up and the construction is so very loud! Boo to construction but I know you LOVE LOVE LOVE your house! My dad owns a construction company, and his workshop was right next door to our house, so that was the entire first 17 years of my life. =) I hope it goes away soon and you get awesome neighbors! Ugh, I hear you!!! Ours works on the weekends as well so you never catch a break! 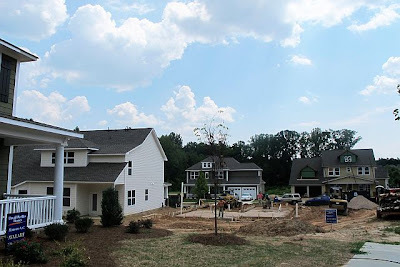 Now that other houses are finally going in beside us and across from us- it's like a mad rush to get home to see what color brick or siding goes on the house to make sure it doesn't look like ours, haha! aah, construction! we're in the same boat, but its worth it! And when its all done, the area will be gorgeous! when I bought my first condo, I was the ONLY one who lived there and yes my condo was also the ONLY one finished. ALSO, the new condo development was way out in a part of town that was kind of deserted at the time. SO, it was JUST ME, a 22 year old girl, living out in the boons ALL BY MYSELF in the only finished condo, and one night my doorbell rang and like a fool I opened it and there was this haggard looking man (no joke) asking for "directions" somewhere. He didn't have a car so I assume he was walking, but where would he want directions to? It's out in the middle of nowhere. I kinda gave him a blaise answer and shut the door. Good think I made it out of that one alive!